These days there seems to be a cleaner for everything in your home - windows, countertops, bathrooms, toilets and more! But do we ever ask ourselves why there are so many cleaners in the first place? And what are these cleaners really made from anyway? That's it! I clean the entire house on just a few inexpensive ingredients. Along with rags, dust cloths, and a reusable cloth floor pad I can get the job done with ease. Slowly replace old cleaners with homemade natural ones! Here are my no-fuss cleaners that I make at home. These are so quick and easy to make! I can make them all in under 10 minutes. You might have your own favorite recipe that you like to make for yourself! There are lots of variations of natural cleaners. The exact amounts are going to differ depending on what container you use, so these may be rough estimates for you. In a mason jar, soak lemon peels with vinegar for two weeks in the dark. Drain and add to reusable sprayer. 2 drops dish soap (I get in bulk) and warm water. Olive Oil on a rag and rub onto stainless steel until shiny! American's produce a lot of waste through restaurant takeout. If you've every had leftovers from a restaurant then you've probably at one point had it wrapped up in plastic, styrofoam, and then tossed in a plastic bag. Not to mention the plastic wrapped utensils, napkins, and plastic sauce cups, and drinking cups they throw in too. That is a lot of waste! There are a number of ways to reduce our takeout footprint. It all starts with being mindful of where we are going and what we are eating. And to simply refuse disposable to-go containers whenever possible! From a small mason jar to stainless steel containers and bento boxes there are plenty of options for taking home your leftovers. Check with your favorite local restaurant about bringing your own containers to drop off for them to fill up with your favorite meal. Explain why you are doing this as well. Try these portable stainless steel containers. I always have my small mason jar with me for the unexpected leftovers if I'm out. I once crammed a slices of vegan pizza into my mason jar! Americans use more than a100 million pieces of plastic utensils every day. These plastic utensils can take up to 1000 years to decompose, leaking harmful substance into the Earth while they break down. Keep with you a small To-Go Ware utensil set or a folding spork from Life Without Plastic. Ask your local restaurant to make the switch to compostable to-go containers or encourage a reusable to-go container system. Your voice matters. Businesses have no incentive to change until they hear from you! We seem to toss about everything we use and buy these days. And in our fast-paced society, this throw-away culture seems like it's a good solution for adding more time and convenience into our hectic schedules. Right? Not exactly. Instead it has given us the worst headache of over consumerism, environmental problems, and it's unknowingly slowly emptying our pocketbooks. More and more products (that used to be reusable) have now moved to a single-use disposable version. Everything from utensils, floss picks, food packaging, straws, plates, and snack bags. Disposables are everywhere! But there is one item that seems to rise above the rest of these single-use items. 1 MILLION DISPOSABLE CUPS END UP IN THE LANDFILL EVERY MINUTE. Every minute! Many of these cups appear to be made of paper, but actually they are commonly lined with polyethylene and attached with polystyrene lids. Because of this very thin lining of plastic inside the cup, they can't be recycled. In past articles, we talked about how recycling is an aspirin to our over consumption, not a solution. The solution can be as simple as these two things. 1. Ask for your coffee or drink cup in a real cup (if you're staying and if the establishment even has them). 2. Bring your own cup for them to refill. Often establishments will give a small discount for bringing your own cup. And if an establishment doesn't let you bring your own cup. Let them know your concerns and don't go there anymore until they change. Remember consumer demand trumps all. Get yourself a durable reusable cup that means something to you! If it has value to you, then you won't easily lose it. Over 4.7 billion plastic toothbrushes are produced every year worldwide. Where do you think those plastic toothbrushes are going when you're done with them? Many find their way into the ocean, while the rest get incinerated or buried forever in a landfill. Talk about wasted resources. I've switched over to a bamboo handled toothbrush two years ago and I'll never go back to a plastic handled toothbrushes again! I've used a few different bamboo toothbrushes in the past and while I think they were good, I really like and prefer the Brush with Bamboo brand. 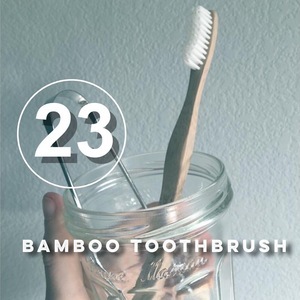 Make the switch from a plastic toothbrush to a bamboo one! Recycling is the feel good action for everyday people. Yet, it is full of holes and misunderstandings. Let's start off with this quote. A zero-waste mindset doesn't mean recycling more, it means recycling less. Recycling truly is an aspirin to a much bigger problem, our overconsumption and misuse of materials. We simply produce too many materials globally for recycling to make a dent. We have to rethink materials and we have to understand more as consumers about recycling in general. The items you place in the recycling bin each week are not guaranteed to be magically turned into another usable item. Recycling is a business. Which means if there is no one to buy the materials we offer up to our recycling bins each week, then those items head (most likely) to a landfill or incinerator instead of renewing themselves into a product. Materials must have value to be used for another application. And if it doesn't have value, then there is no need in buying that material. So if we as consumers are not buying materials made from recycled products, then there is no reason for the manufacturers to buy recycled content from recyclers. Make sense? I'd love to be able to tell you what can be recycled and what can't be, but I can't. Here in the U.S. recycling is privatized, which to sum up quickly means no one is on the same page about the recovery of materials. For example, what we can recycle here in Boulder, CO, may not be accepted in Denver, CO (only 28 miles away). Likewise, what we recycle here in Boulder, like glass for instance, other places in the U.S. don't even recycle! You have to truly check your local recycling facilities requirements and what they accept and don't accept. Every place is different. Learn to recycle less! Try to take the recycling bin out one or two less times each month. How? By refusing, reducing, and reusing items that we purchase and bring into our home. Concentrate on making less plastic waste. We simply produce too much plastic to recover it all through recycling. I love cloth bulk bags! Why? Because you can use them for so many applications! And when you're trying to avoid trash and plastic (especially around food) they are super handy dandy! Here are just two of the most common and useful ways I use them and even where you can get yourself some too! I have at least 15 of these bags in a range of sizes and materials (some handmade and some store bought). I use them for bringing home fruits and veggies instead of the plastic bags they give out in the grocery store. I also use it for bulk food items in bulk bins. Everything from grains to dried beans, fruit, and sweets! In order not to pay for the weight of the bag when you check out, you'll need to have the weight of the bag (the tare) written or committed to memory. If your bag doesn't have a tare weight on it, bring the empty bag to the service desk of any grocery store and have them weight out the bag. Once you know the weight of the bag you can now tell the cashier so she can subtract that amount from the bulk goods inside. I know many people like to reuse the plastic produce bags in the grocery store, and while I think that's fine, just remember that many single-use plastics like produce bags were only designed to be used once. We have to remember that plastics are made with petroleum and other (often undisclosed) additives and chemicals. Plastics tend to slowly photo-degrade around light and heat making them a bit unstable and constantly breaking down. Not something you necessarily want around your food or drink or in the environment. Plastic isn't digested by the planet, so avoid it in single-use applications as much as you can. Plastics are not evil, we just greatly misuse the material. Whether I'm hitting up a local bakery, bulk bin for chocolate or a fruit stand, I always have some kind of small cloth produce bag with me to tote it home in! I especially love having one or two of these small bags while I'm traveling for the same reasons. I have even put a leftover sandwich in one before. A FEW PLACE TO GET YOUR OWN! AND A VIDEO ON HOW TO MAKE YOUR OWN! It's summer time here in the U.S. and that means long hot days, and lots of good produce! This time of year I concentrate on light and simply meals that I don't have to turn on the oven or stovetop for. These meals tend to be refreshing, plant-based, and next to zero packaging. You can get many of the ingredients from your local farmer's market or just by shopping the edges of your local grocery store. Remember to bring your own cloth produce bags for your veggies or fruit, or just stick them right into your cart. If you can't find seasonings or grains and seeds in bulk, try to find the next best thing, items packaged in glass or recycled paper containers. 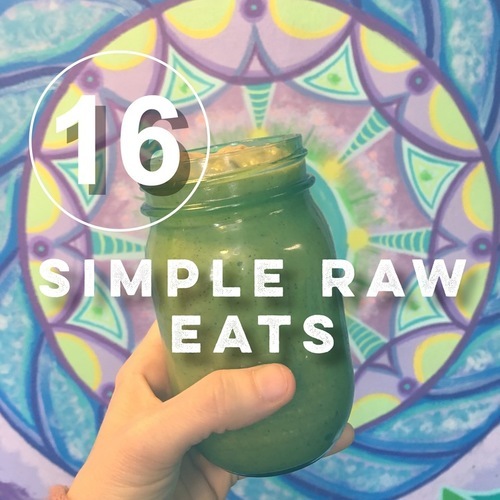 I'm going to share three of my favorite no cook meals that hopefully you'll love too! This is self explanatory! It's a smoothie in a bowl. I like to add chopped nuts, chia seeds, or sliced fresh fruit to the top for added texture. Somehow a smoothie in a bowl changes everything. I like to get fresh fruit unpackaged. Berries are harder if you don't live in an area where you can pick them yourself. I only eat berries when I can pick them (I freeze what I can for the winter). My go-to smoothie is banana, homemade almond milk, and any seasonal fruit available. Let's just start out by saying that the ability to walk, bike, or take public transportation may not be available to everyone. We all have different mobility paths due to either external or even physical circumstances. We may live in a place where we don't have access to safe sidewalks, bike paths, or reliable transportation. But what we do all have in common is personal power. The power to individually create change in our local communities. When it comes to alternative forms of transportation, it can be especially hard when our towns and cities are not set up for biking or walking. If that is the case, then gather your community up and voice your opinion. Make some waves. One person can make difference. Why move towards more alternative travel? It's good for building community and very good for the environment! Developing alternative transportation pathways for communities offers up advantages like safer streets and more access to local shops and establishments. These help create closer knit communities, reduce traffic, pollution, and slowly re-develop urban planning to include alternative transportation. It's also way cheaper than owning and maintaining a vehicle. I love to walk. It's not the fastest way somewhere, but if you plan out your walk around your errands you also tack on exercise too! Many cities, like here in Boulder, CO, have expanded multi-path sidewalks on busy streets that can accommodate pedestrians and cyclists on the same pathway. This makes it much easier to walk more directly toward your destination, rather than taking side streets or paths. Again, walking may not be an option for you because of distance or other circumstances, but if it is, explore what your city has to offer and also voice your opinion to your local city council if they are stubborn on alternative transportation. Many cities across the United States are beginning to roll out bike sharing programs. Here in Boulder we have a bike sharing program called B-Cycles. There are bike stations all around the city to utilize. Everything is included in the bike! You don't have to maintain the bike or own your own locks, lights, or basket! If your town doesn't have a bike sharing program in place, ask for one! No bike sharing in your area yet? Then ride your own bike. There is a great organization called People Bikesto help put more people on their bikes. Your local city may have information on bike paths and commuting designed specifically for your area. Watch this short video on bike sharing! This week, replace one car trip (if you can) by either walking, biking, or taking a form of public transportation. Massive amounts of dog poop litter I picked up in our neighborhood. Picking up after your pet is very important! Pet waste enters our water systems and pollutes it! Just like people, pets also have trash problems! From poorly designed plastic based toys, overly packaged treats and food products, and plastic poop bags, our pets create trash too! More green products are coming out for our furry little friends, but we still have a long way to go until we get to a zero waste model of design and production. Luckily, the same zero waste mindset applies to pets as it does to people. 3. Support local community pet stores and and let companies know you want to see more eco-based options. I've listed a few ideas and resources to create less waste for your pet! In our home, we just have a dog, so I've tried to include some cat centered items too! Look in your community for bulk snacks and treats. Our local pet store has a selection of dog and cat treats in bulk. I bring my cloth produce bag that is specifically for Cosmo to be refilled with his favorite snacks. I sometimes even bake my own treats for him. There are plenty of easy recipes online to cater to all kinds of diets and allergies. Head to your local meat counter with a reusable container or jar and ask for bones that your dog can chew on. I've gotten them for free at times! Hemp rope toy. My dog LOVES these. Toys made of plastics and synthetic fibers turn into trash after they've been chewed and ripped up. Instead, think natural based materials materials like hemp, organic cotton, natural based chew toys, and mindful packaging like 100% recycled paper boards. If you have access to a compost, many of these natural based fibers can be composted. Steer clear of plastic-based and synthetic fibers. Do your best with this one. The best option is to use compostable compostable pet poop bags. Even if you can't compost them, you're still eliminating toxic plastic and voting for better eco-products. Ask for better product design! This is essential if we want to see change. Companies and businesses want our dollar, so letting them know you want better packaging or ingredients is important. Tweet, Facebook, email, or ask in person for packaging and products that are sustainable from design to disposal. Next time you need a new toy for your pet, think natural and lasting materials. Invest in a compostable plastic-free cat tray liners or dog poop bags - check out BioBags or Earth Rated for options. Ask for better! Companies need to hear from you! They have no incentive to make changes unless they know what we want. Food waste has been gaining lots of attention in our society. Why? Because we waste a lot. And I mean a lot. In the United States, 30-40% of the food supply is wasted - equaling more than 20 pounds of food per person per month. There is a lot we can do to eliminate food waste. First, eat the food you buy, buy only what you need, pre-plan meals, and be more resourceful with your meal planning. And even after we've done all of that, there will still be some food waste in the form of scraps and the occasional forgotten item that went bad before usage. The food scraps we toss in our trash cans head straight to the landfill. This isn't a good idea. Landfills are not a big composter, they are essentially a big tomb. Landfills produce a gas called methane, because landfills don't receive oxygen. It does this by experiencing anaerobic decomposition. When we add our food waste to a compost pile a different kind of interaction happens. Our waste in a compost becomes exposed to oxygen, from worms, other living organisms, or by rotating it. This produces CO2 (carbon dioxide), not methane. This process is called aerobic decomposition. "Organics that break down in a landfill produce methane gas, which is about 120 times more harmful than carbon dioxide," says Cary Oshins, assistant director for programs at the United States Composting Council, in Ronkonkoma, New York. Vermicomposting is the process of composting using worms. The most common worms used in vermicomposting are red wigglers. To put things simply, the worms eat the food scraps and poop out the compost called vermicast. This is the method I used when I had no yard and not other options. People often worry about smell with indoor (and outdoor) composts. But you have to remember, there is a little science involved in this process. You never want to overfill your compost, too wet, too dry, etc. And since worms are doing a majority of the composting action you don't want to overfeed them. What they can't eat will rot and smell. egg shells *some commercial composting facilities will except some meat/cheeses, check with your local compost center first! Many foodservice paper products are lined with petroleum-based plastics that contaminate our soils when composted! Only compost if it's a certified compostable "plastic". Don't put commercial compostable items (straws, utensils, cups, containers) in your home compost. They are not designed to breakdown in your home unit. They actually hardly break down in commercial facilities. HOW TO STORE YOUR COMPOST! This is VERY important! Do not put your compost scraps in plastic bags! I repeat. Do not put your compost scraps in plastic bags! Especially if you have curbside composting in your area. It makes it a lot of work to pick through the compost and rid them of plastic bags. 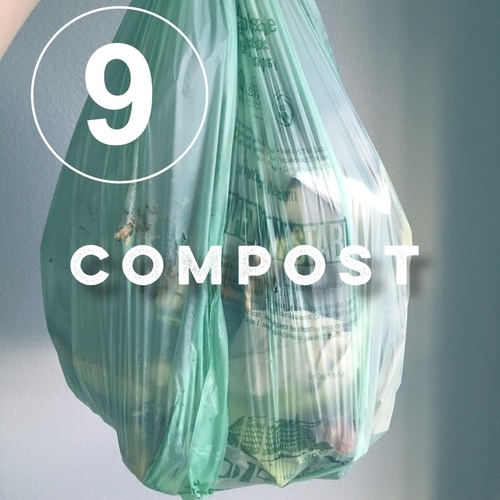 If you have to wait to bring your compost somewhere (like a local farm, neighbors, or community garden), you can store you compost a few ways. Use a certified compostable liner to store your scrapes in for delivery. Compostable bag liners for collecting your compost - not made from plastic! CompoKeeper - This is my favorite system for my home. It keeps our food scraps in a simple, contained, and smell free bin. It's easy to clean too. And when the compostable liner is full we toss it in our cities curbside composting bin to wheel out to the curb every other week! It's a great system for the office too! Check them out! Worms Eat My Garbage: A great book for learning how to set up your own worm (verimcomposting) bin! Do you have overstuffed closets, drawers, and garages? Have you ever felt overwhelmed by these overstuffed spaces? Overwhelmed by stuff? Our society has become a consumer-based culture. There is nothing wrong with consumerism, I think we are just consuming in a way that is missing some important key ingredients. I believe that we've lost value in the materials that go into making something. We've forgotten the value in craftsmanship, quality, durability, and functionality. Decluttering can seem very overwhelming at first. But remembering these few key ideas will have you remove the unnecessary and keep it that way. Clutter. It keeps up disorganized, overwhelmed, and distracted. Putting value back into our belongings is a huge step to keep clutter away. If we love and value something we keep a good eye on it, we take care of it, repair it, use it well, and it's something we want to even pass down to our future family. Make purchases based on functionality, repairability, and durability. Less, but better. By editing out what you no longer need you bring more spaciousness into life. And when you have more spaciousness (especially the feeling of it), life becomes a little less overwhelming, less distracted, and you'll have less to organize and clean too. Decluttering, in all honestly, is a personally experience that will reflect your personal life. So start small. For me, I had to realign my mindset to material belongings and understand what I really valued and how to surround myself with people, things, and experiences that mattered the most. This mindset will give you the best results. Not so long ago people used handkerchiefs to wipe their noses, chins, and faces from wet kisses or the occasional runny nose. I remember watching my grandma iron her handkerchiefs after they came off the clothes lines. They were neatly folded, crisp, and ready for the week ahead. Vintage handkerchiefs from my grandma(s). Clearly I don't iron like my grandma did. Nowadays, handkerchiefs have taken the back seat to yet another disposable single-use item, the paper tissue. Having to wash and dry tissues, who's got time for that? It sounds messy and down-right time consuming, right? One of the core mindsets of this zero waste journey is simplicity. And creating a simple handkerchief system for your personal routine will make these nose blowers a well-loved and appreciated part of your everyday life. Why did our grandparents use them? Well again, the idea of buying something to use once and toss wasn't a smart idea. And people didn't have as much stuff as we do now, so you were a bit more intentional about what your purchases were and how you used them in your life. Items were often made to last as well. Handkerchiefs were something personal too. You could reflect your own style in the kinds you used. I have a few handkerchiefs from my grandma that she used just for the summer time - embroidered tropical birds and all. And for the spring time, purple embroidered flowers. It was special and pretty to use, even if it was just for blowing your nose with. I still use the same handkerchiefs that my grandma and great grandma used! Talk about lasting quality! Not so long ago the concept of using something once and tossing it out was seriously frowned upon. Why spend the time and energy to go to a store, spend good money on something, just to toss it after one use? In fact, our American culture was trained to accept this new throw-away lifestyle after a lot of convincing by advertising companies. Needless to say, our culture shifted and we are hooked on the conviences of the toss-and-go lifestyle. Beyond just the throw-away culture, commercial paper products (like tissues) can often come from virgin forests and also contain a host of chemicals for whitening and processing. Many commercial brand tissues are bleached with the most common offender, chlorine. Chlorine is in many paper-based products; such as paper towels, toilet paper, tissues, coffee filters, and milk cartons. These toxic substances pollute our waterways and even enter our bodies through our skin and get into our bloodstream. Okay, so bleaching and disposables are no bueno. So what's another solution? Reusable cotton handkerchiefs and wipes. Ahhh, but you say "gross" and "germy". I say, if it was good enough from your grandma, it's good enough for you! The key to using handkerchiefs is to have a system in place. There are some great places where you can get soft, organic, reusable tissues. You can also make your own from old sheets or clothing. I have a whole jar of hankies from an old cotton circle scarf. I also have inherited a few from my grandparents and my husband's grandparents too. Vintage shops and thrift stores often have well-loved hankies. HankyBook: A book of hankies! Soft, absorbent and reusable! I created a system with my hankies. I keep a few mason jars around the house stuffed full of them and a little basket underneath or nearby the tissue jar for easy tossing. I have enough of them that I'm not doing wash all the time. And there cut to just the right size that they are easy to hang-dry. When it's not cold and flu season, I wash them with towels or toss them into a small load of wash. But if someone's got a nasty cold, I wash them separately with hot water. Luckily, that only happens maybe once a year. Find yourself some unbleached, 100% recycled tissues, or toilet paper (something like these: Seventh Generation) and when you're done (try to) compost them! Here in North America, it is now summer time! It's time to enjoy the warmth, summer activities, and best of all, nature! But even if it's not summer where you live in the world, there are always opportunities to embrace and enjoy the outdoors! Part of a zero waste mindset is to put value back into our natural world. What do I mean by that? It means that we see our living ecosystems as a unique and vital part of our collective survival. It means we consider how and where things are made. It means consuming better. It means we have a greater understanding about our local ecosystems and how important they are to the whole planet. So when we embrace and put value back into our resources and environment, we are collectively saying that we want a planet that is nourished and healthy. And there is no better way to get reconnected to nature than by going outside! There are plenty of ways to keep the zero waste mindset as we enjoy nature. Try incorporating these three ideas all summer or all year long! Simplify your experiences! It's easy to head to the mall and start shopping, but why not switch our over-consuming habits to experience-based ones? We can support our local economy by visiting a state park, wildlife refuge, and or sanctuary. Many state and local parks have annual seasonal passes for you to enjoy as well. Whether it's spring, summer, fall, or winter there are so many opportunities to enjoy the outdoors. Outdoor journaling in the spring, outdoor dinners in the summer evening, fall leaf collecting, or getting bundled up for mindful and quiet walks in the winter. These are just a few examples of how to embrace the seasons all year round! Going outside doesn't have to be a trash fest. Remember to use your greatest zero waste weapon - refusing. Refuse single-use disposables like plastic water bottles and individually wrapped snacks. Instead carry your own sturdy and lasting reusable bottle. 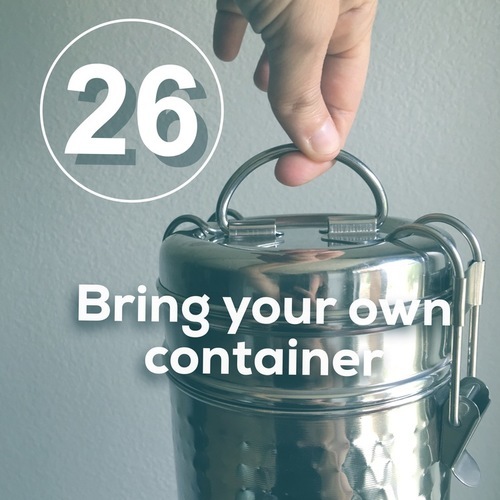 Pack your own snacks in small mason jars or stainless steel containers (you can get your own via Life Without Plastic's website). I love to take dried fruits, nuts, and seeds in my containers for healthy and tasty snacks outdoors. Each day, make an attempt to spend up to 15 minutes (or longer!) outdoors. Get to know a part of your outdoor community. And remember to BYOB (bring your own)! If you've ever ordered a drink in a restaurant or bar, you mostly likely received a plastic straw. Have you ever thought about where those come from? How they're made? Where do those straws go to when you're done with them? And, why do we even need them anyway? It's estimated that nearly 500 million plastic straws are used every single day in the United States alone. Whoa. 500 million? Can you even imagine that many straws? So what's wrong with these little plastic sippers? Plastic is one of those things that is great for certain applications, but not good for things we use once and toss. It photo-degrades (which means it breaks down by sunlight) into tinier and tinier pieces that attract more organic pollutants. These pieces are mistaken as food and ingested by all kinds of land and marine wildlife - even plankton! Very few places are (just) now accepting straws as part of recycling, but remember recycling is a costly application and when it comes to plastics, they're usually only down-cycled into inferior plastics that usually can't be recycled again. Use your consumer power and voice to ask for no straw with your drinks. There are great plastic-free alternatives (stainless steel, bamboo, and sturdy glass) that you can have to bring with you anywhere you go! And, there are simple ways to clean them too! Check out the links below to get your own! Let your local restaurant, eatery, or cafe know that you'd like to see straws given out on request only, or switch to a compostable or paper version. You could even create a local petition to ban plastic-based straws in your city or town! WHERE TO GET YOUR OWN REUSABLE STRAW? I have used all kinds of reusable straws, and honestly, I've personally been pleased with them all. Here are a few links to some of my favorite companies that have reusable straws as well as other zero waste alternatives for you to try! Refuse disposable straws every time you order any drink. Remember! You still might get one even though you refused! That's ok! This isn't about being perfect! This is about bringing awareness to the single-use disposable problem. Be gentle on yourself and others.